Innobaby's Din Din Smart Stainless Steel Divided Platter with Sectional Lid makes meals at home and on the go easy and fun, even for picky toddlers and beginning self feeders. The kid friendly, bus shaped divided plate has five separate compartments, perfect for introducing a balanced diet and new foods. 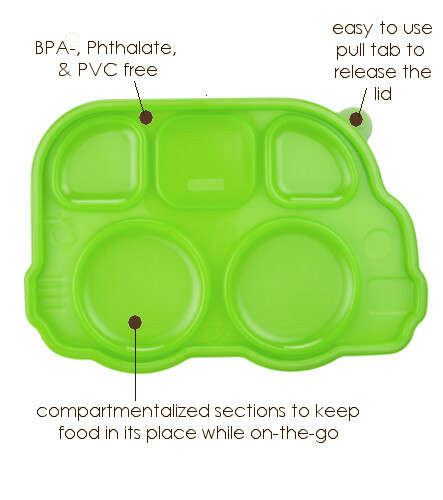 This divided plate for kids has separate compartments to prevent food from sliding and mixing, while the sectional lid keeps food in place while on the go. This kid friendly, nontoxic, worry free dinnerware solution is made with highest quality food grade type 304 stainless steel. Our children’s separated plate is sure to outlast any other; it will not stain, harbor orders, rust or crack. Innobaby has a complete line of nontoxic stainless feeding products for your child. Pair the Innobaby Din Din Smart Stainless Divided Platter with our entire line of stainless steel products including stainless steel cups, bowls and utensils. 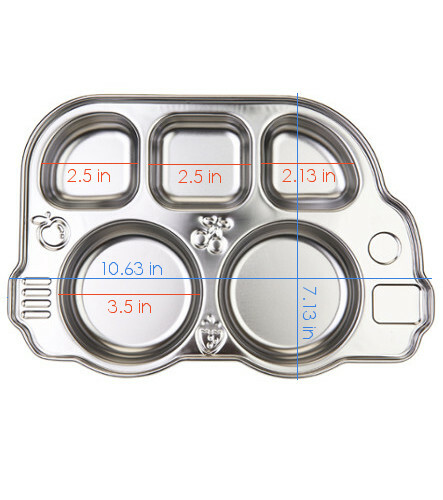 100% SAFE FOR YOUR CHILD - The ORIGINAL Innobaby Bus Platter is made of the highest quality, food grade 304 stainless steel (18/10 stainless) in South Korea. This product is nontoxic, BPA free, Phthalate free, PVC free and lead free. BUILD HEALTHY EATING HABITS EVEN FOR THE PICKIEST EATERS - Our kid friendly design & colorful lids make meal & snack times fun. This separated plate has 5 compartments making food introduction easier and allowing picky eaters to keep food from touching. PERFECT FOR DAYCARE AND SCHOOL LUNCHES - Pack a lunch and rest assured the food will stay put in this separated plate. Our stay tight lid will keep food in its place, even on the go. DURABLE AND GOOD FOR THE ENVIRONMENT – Our stainless steel kids cups, bowls, plates, forks and spoons will not stain, harbor orders, rust or crack. Rid yourself and the environment of plastic and paper plates for good – opt for stainless steel. MAKE IT A SET– Innobaby has a complete line of stainless steel toddler feeding products including stainless steel cups, stainless steel bowls and stainless steel silverware. I never thought that something as simple as a cute divided plate would have such an impact on mealtime. My picky toddler now actually eats the food he is given, whereas before he would just look at us like we were crazy. The divided plate helps me give variety and right portions, too, as I'm eager to fill every section instead of just looking at a plate/bowl with one thing and thinking it done. The cover is brilliant because the toddlers food can go straight in the fridge instead of having to find extra containers for leftovers. I love these plates, my only regret is we only got one for each child! My twin girls love these bus-shaped plates. There are many compartments, so we can offer a variety of foods in perfect portions. These plates are easy to wash, either by hand or by dishwasher. They are made from high-quality stainless steel. The best part is, the platters came with covers, so we can bring them with us on-the-go! My twin girls love these bus-shaped plates. There are many compartments, so we can offer a variety of foods in perfect portions. These plates are easy to wash, either by hand or by dishwasher. They are made from high-quality stainless steel. The best part is, the platters we bought came with covers, so we can bring them with us on-the-go! Top Notch Service and Product! First of all, the Innobaby staff are superb!! I had a minor issue and they were fantastically helpful and accommodating. That alone, was a major bonus. In addition to that, this platter is super cute. Preparing snacks and meals will be just as much fun for me as they'll be for my little one. I can't wait to purchase more! Click the button below to add the Din Din SMART™ Stainless Divided Platter with Sectional Lid - Pink to your wish list.